SEASIDE PARK, New Jersey (WABC) -- New Jersey Gov. Chris Christie said Sunday "we have some promising leads but no suspects" in Saturday's pipe bomb explosion in Seaside Park, shortly before thousands of runners were to participate in a charity 5K race to benefit Marines and sailors. When asked if it is terrorism, Christie said he considers both the explosion in Chelsea Saturday night and the Seaside Park blast terrorism. "There's no doubt about that." But he said there is nothing to link the two. The FBI alerted Sunday morning that their scene in Seaside Park has been cleared. However Belmar Mayor Matt Doherty canceled Sunday's planned San Genarro Festival, citing "public safety concerns." A seafood festival in Point Pleasant Beach was also canceled. Local and state police along with the FBI and ATF quickly flooded the quiet beach town of Seaside Park as bomb experts carefully removed and dissected what appeared to be three pipes intricately wrapped together inside a garbage can near D St. and Ocean Ave. Only the pipe detonated, and luckily no one nearby was hurt. A four-block area near the explosion was evacuated around the scene. Jersey Shore beaches were reopened Sunday as the investigation continued. Special Agent Michael Whitaker, a spokesman for the FBI office in Newark, said state and federal investigators were canvassing the Seaside Park area Sunday and conducting interviews. He said travel restrictions imposed after the blast had been lifted. He declined further comment, citing the ongoing investigation. New Jersey state police also wouldn't comment and referred questions about the blast to the FBI. The race had been scheduled to start shortly before the blast occurred, but it was delayed due to the large numbers of people registering for the race and reports of an unattended backpack being found. 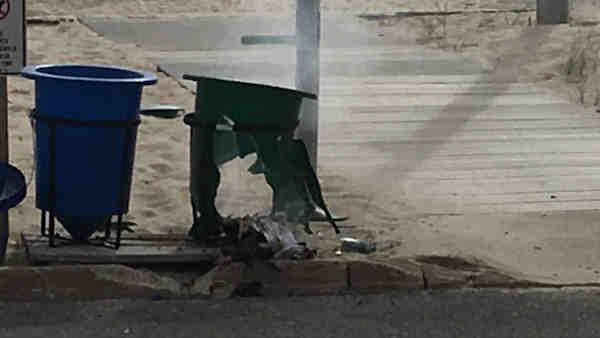 The pipe bomb was in a plastic garbage can when it exploded, Al Della Fave, spokesman for the Ocean County Prosecutor's office said, but the immediate area where the blast occurred was mostly empty at the time. Authorities immediately cleared the boardwalk and beach area, and bomb-sniffing dogs were used to search the area.